Not until Jonathan Crisp were taken over by Tayto did they get their packaging correct. Each variety has an impressive British characteristic and all bags are flavour colour coded. The hand written branding is offset by the same colour, but a little too small flavour description. 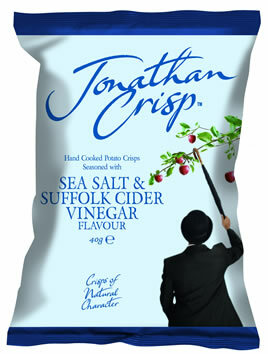 These Crisps featured a classic Hand Cooked Crisp Crunch. A nice balance between gradual degradation from a firm and meaty Crunch to a mulchy finish. These were particularly exciting looking Crisps. They were bendy, gnarly constituents in the bag. All had a plentiful supply of oil blisters. There was a thick and meaty look and feel to them and plentiful seasoning visible. These Crisps featured a perfectly formed balance between Beef and Horseradish. However, they were sadly light on flavouring. You would think that when a flavour is mastered they would include plenty of it to matter! Having said that, the most important part is they got the flavour right and indeed, several Crisps at once provided the desired impact.